We've seen how Whewell solved the problem of the equilibrium shape of chain hanging between two places, by finding how the forces on a length of chain, the tension at the two ends and its weight, balanced. We're now going to look at a completely different approach: the equilibrium configuration is an energy minimum, so small deviations from it can only make second-order changes in the gravitational potential energy. Here we'll find how analyzing that leads to a differential equation for the curve, and how the technique developed can be successfully applied of a vast array of problems. where we have taken the rope density and both equal to unity for mathematical convenience. Usually in calculus we minimize a function with respect to a single variable, or several variables. Here the potential energy is a function of a function, equivalent to an infinite number of variables, and our problem is to minimize it with respect to arbitrary small variations of that function. In other words, if we nudge the chain somewhere, and its motion is damped by air or internal friction, it will settle down again in the catenary configuration. This method of solving the problem is called the calculus of variations: in ordinary calculus, we make an infinitesimal change in a variable, and compute the corresponding change in a function, and if it's zero to leading order in the small change, we're at an extreme value. The difference here is that the potential energy of the hanging change isn't just a function of a variable, or even of a number of variables -- it's a function of a function, it depends on the position of every point on the chain (in the limit of infinitely small links, that is, or equivalently a continuous rope). So, we're looking for the configuration where the potential energy doesn't change to first order for any infinitesimal change in the curve of its position, subject to fixed endpoints, and a fixed chain length. As a warm up, we'll consider a simpler -- but closely related -- problem. 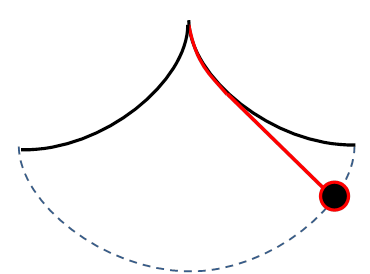 This problem is very similar to the catenary: surface tension will pull the soap film to the minimum possible total area compatible with the fixed boundaries (and neglecting gravity, which is a small effect). That is, we want to first order, if we make a change . Of course, this also means where . This general result is called the Euler-Lagrange equation. It's very important -- you'll be seeing it again. with a the constant of integration, which will depend on the endpoints. This is a first-order differential equation, and can be solved. Here is the second constant of integration, the fixed endpoints determine . 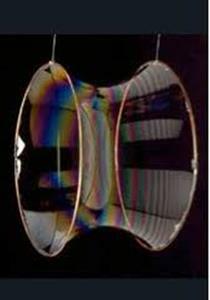 the same as the area function for the soap film. But there's an important physical difference: the chain has a fixed length. The soap film is free to adjust its "length" to minimize the total area. The chain isn't -- it's constrained. How do we deal with that? The problem of finding minima (or maxima) of a function subject to constraints was first solved by Lagrange. A simple example will suffice to show the method. 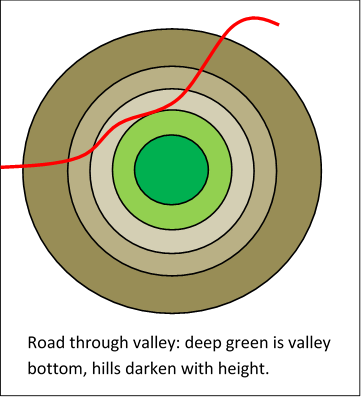 Let's write the curve, the road, (the wiggly red line in the figure below). To find the closest approach point algebraically, we need to minimize (square of distance to origin) subject to the constraint . In the figure, we've drawn curves for a range of values of (the circles centered at the origin). We need to find the point of intersection of with the smallest circle it intersects -- and it's clear from the figure that it must touch that circle (if it crosses, it will necessarily get closer to the origin). Therefore, at that point, the curves and are parallel. Therefore the normals to the curves are also parallel: . The constant introduced here is called a Lagrange multiplier. It's just the ratio of the lengths of the two normal vectors (of course, "normal" here means the vectors are perpendicular to the curves, they are not normalized to unit length!) We can find in terms of but at this point we don't know their values. We have transformed a constrained minimization problem in two dimensions to an unconstrained minimization problem in three dimensions! The first two equations can be solved to find and the ratio , the third equation then gives separately. Lagrange multipliers are widely used in economics, and other useful subjects such as traffic optimization. Remarkably, the effect of the constraint is to give a simple adjustable parameter, the origin in the direction, so that we can satisfy the endpoint and length requirements. with a constant of integration, which will depend on the endpoints. Here is the second constant of integration, the fixed endpoints and length give In general, the equations must be solved numerically. To get some feel for why this will always work, note that changing varies how rapidly the cosh curve climbs from its low point of , increasing "fattens" the curve, then by varying we can move that lowest point to the lowest point of the chain (or rather of the catenary, since it might be outside the range covered by the physical chain). Exercise: try applying this reasoning to finding for the soap film minimization problem. In that case, we know and , there is no length conservation requirement, to find we must eliminate the unknown from the equations This is not difficult, but, in contrast to the chain, does not give in terms of , instead, appear separately. Explain, in terms of the physics of the two systems, why this is so different from the chain. Suppose you have two points, A and B, B is below A, but not directly below. You have some smooth, let's say frictionless, wire, and a bead that slides on the wire. The problem is to curve the wire from A down to B in such a way that the bead makes the trip as quickly as possible. This optimal curve is called the "brachistochrone", which is just the Greek for "shortest time". But what, exactly, is this curve, that is, what is , in the obvious notation? This was the challenge problem posed by Johann Bernoulli to the mathematicians of Europe in a Journal run by Leibniz in June 1696. Isaac Newton was working fulltime running the Royal Mint, recoining England, and hanging counterfeiters. Nevertheless, ending a full day's work at 4 pm, and finding the problem delivered to him, he solved it by 4am the next morning, and sent the solution anonymously to Bernoulli. Bernoulli remarked of the anonymous solution "I recognize the lion by his clawmark". This was the beginning of the Calculus of Variations. being a constant of integration (the 2 proves convenient). Recalling that the curve starts at the origin A, it must begin by going vertically downward, since For small enough , we can approximate by ignoring the 1, so , . The curve must however become horizontal if it gets as far down as , and it cannot go below that level. where we've fixed the constant of integration so that the curve goes through the origin (at ). To see what this curve looks like, first ignore the term in , leaving Evidently as increases from zero, the point goes anticlockwise around a circle of radius centered at , that is, touching the -axis at the origin. Now adding the back in, this circular motion move steadily to the right, in such a way that the initial direction of the path is vertically down. (For very small ). Visualizing the total motion as steadily increases, The center moves from its original position at to the right at a speed Meanwhile, the point is moving round the circle anticlockwise at this same speed. Putting together the center's linear velocity with the corresponding angular velocity, we see the motion is the path of a point on the rim of a wheel rolling without sliding along a road (upside down in our case, of course). This is a cycloid. 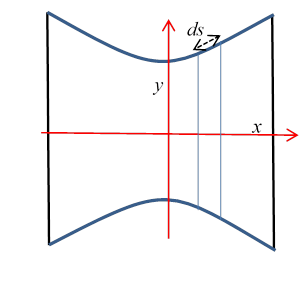 Suppose we want to find the curve a bead slides down to minimize the time from the origin to some specified horizontal displacement X, but we don't care what vertical drop that entails. In the earlier treatment, both endpoints were fixed, so we dropped that final term. However, we are now trying to find the fastest time for a given horizontal distance, so the final vertical distance is an adjustable parameter: . so at means that , the curve is horizontal at the end So the curve that delivers the bead a given horizontal distance the fastest is the half-cycloid (inverted) flat at the end. It's easy to see this fixes the curve uniquely: think of the curve as generated by a rolling wheel, one half-turn of the wheel takes the top point to the bottom in distance X. Exercise: how low does it go? Around the time of Newton, the best timekeepers were pendulum clocks -- but the time of oscillation of a simple pendulum depends on its amplitude, although of course the correction is small for small amplitude. The pendulum takes longer for larger amplitude. This can be corrected for by having the string constrained between enclosing surfaces to steepen the pendulum's path for larger amplitudes, and thereby speed it up. It turns out (and was proved geometrically by Newton) that the ideal pendulum path is a cycloid. Thinking in terms of the equivalent bead on a wire problem, with a symmetric cycloid replacing the circular arc of an ordinary pendulum, if the bead is let go from rest at any point on the wire, it will reach the center in the same time as from any other point. So a clock with a pendulum constrained to such a path will keep very good time, and not be sensitive to the amplitude of swing. As before, we can now write , etc., to find that is in fact independent of . Exercise: As you well know, a simple harmonic oscillator, a mass on a linear spring with restoring force , has a period independent of amplitude. Does this mean that a particle sliding on a cycloid is equivalent to a simple harmonic oscillator? Find out by expressing the motion as an equation where the distance variable from the origin is s measured along the curve. Check out sliding along a cycloid here! has a stationary value, and we've seen how it works in some two-dimensional curve examples.